In this video Andor and Chris discuss and review the practice thus far and the goals for the rest of the training. Chris also outlines how he plans on now incorporating the skills that the players learned and worked on in the early part of practice into the game like 6 on 6 portion of practice. All good coaches know that in order to maximize transfer of of skills learned it is critical after they have been practice in drills to bring them into game-like situations. Chris does this excellently. 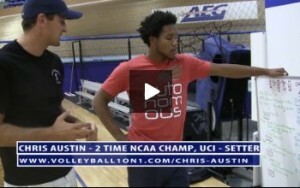 Click to see all of Chris Austin Volleyball Coaching Videos.